Cut the courgette and squash into bite-size pieces and tip into a non-stick roasting tray. Roast in the oven for 15-20 minutes (200C), shaking halfway through cooking. Meanwhile, wash the spinach and cut the celery and cucumber into small pieces and the cherry tomatoes in half. When the vegetables are ready, take them out of the oven and mix through the thyme leaves. Whisk vinegar and olive oil together in a small bowl to make a dressing. Decant into a serving jug. Use the spinach leaves to form a base in your plate, and layer on the celery, cherry tomatoes and cucumbers and then the thyme-roasted vegetables. Top with the feta cheese and pecans and the dressing. Cut the sweet potatoes into chunky size pieces. To make the marinate as mix the honey, mustard, olive oil, tahini paste and salt and pepper and mix it with the sweet potatoes. Put the sesame seed into a plate and ovate every single sweet potato piece, make sure that they are all well covered with the sesame seeds. Put them into a roasting tray and cook in the oven for 15-20 minutes (200C). You can a sauce for dipping as mixing 2 tbsp soy sauce with 1/2 tbsp honey, and 1/2 tbsp tahini. Cut avocado in half and peel off the skin. Lay one-half of the avocado, cut side down, and slice the avocado thinly. You want the slices to be quite thin so that they’re easier to shape. If you want a smaller rose, you’ll only want to use 1/2 of the slices. Use all the slices if you want a large flower. Fan out avocado slices so that they form a long line with the slices overlapping each other. I usually remove the small slices from the ends because they are difficult to shape. 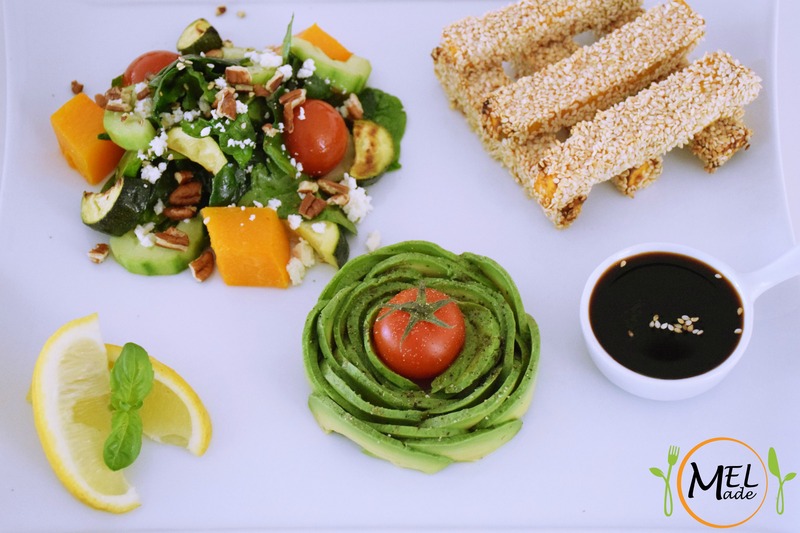 Starting from one end, curl avocado slices toward the center. Continue curling the avocado slices until you get a rose. Sprinkle with lemon juice, salt & pepper.